“Flight” (2012). Cast: Denzel Washington, Kelly Reilly, John Goodman, Don Cheadle, Bruce Greenwood, Melissa Leo, Brian Geraghty, Nadine Velazquez, Tamara Tunie, Peter Gerety, Garcelle Beauvais, Justin Martin, James Badge Dale. Director: Robert Zemeckis. Screenplay: John Gatins. Website. Trailer. “Whip” Whitaker (Denzel Washington) is a highly capable commercial pilot, well-versed in flight procedures and aircraft capabilities. He’s also an alcoholic – granted, a highly functioning alcoholic, but an alcoholic nevertheless. This combination of attributes makes for a potentially volatile mix, too – especially when he steps into the cockpit. One rainy morning, Whip is scheduled to pilot a flight from Orlando to Atlanta. It’s a short trip, one that should be a breeze. But things get off to a shaky start when foul weather results in a rough take-off. Fortunately, Whip successfully steers the aircraft into clear air, putting the plane on course for what should be a smooth flight. Comfortable with the flying conditions, he hands over the helm to his co-pilot, Ken Evans (Brian Geraghty), after which he secretly helps himself to a cocktail and nods off for a nap. And, working with a flight crew that routinely covers for him, he’d ordinarily be able to get away with such reckless behavior without incident, but hopes for that get dashed when circumstances take a sudden, unexpected turn: Not long before landing, the jet begins seriously malfunctioning, threatening to break apart while in midair. Whip snaps awake and takes charge of the situation, performing a daring maneuver to stabilize the aircraft long enough to get it into position for an emergency landing in an open field. During its final descent, however, the plane clips the steeple of a church, crashing to the ground and shattering. Miraculously, most of the passengers and crew survive, including Whip, who’s hailed as a hero. Those accolades are short-lived, though, when the results of his blood alcohol test show that he was legally drunk, an offense that could land him in prison. The airline quickly goes into damage control mode, hiring attorney Hugh Lang (Don Cheadle) to handle the case. Lang seeks to quash Whip’s blood test results (citing procedural irregularities) in an effort to divert attention away from pilot error as a possible cause of the crash. But the success of that tactic is far from guaranteed, especially since the crash inquiry is being handled by one of the NTSB’s most scrupulous investigators, Ellen Block (Melissa Leo). While on leave from flying during the investigation’s pendency, Whip’s free to focus on healing his crash injuries. During his hospital stay, he meets Nicole Maggen (Kelly Reilly), a heroin addict recovering from a near overdose. Their “chance” encounter quickly evolves into a romance, one that seems to suit both of them well in many ways. But their relationship is threatened when each follows a different path with regard to their respective addictions. Nicole is intent on quitting drugs, while Whip resists getting sober, contending that his drinking is a conscious choice, one that he’ll give up when, and only when, he’s ready. Whip’s decision thus brings him face to face with some hard choices on a number of fronts. Will he be able to hold on to his relationship with Nicole, perhaps one of the best developments to come along in his life in quite some time? Can he hold his own in the face of a thorough and potentially career-ending government investigation? But, perhaps most importantly, is he capable of staring down his demons and achieving recovery? Just as Whip maintains with regard to his decision to drink, everything comes down to the conscious choices that he elects to make. The question thus becomes, which ones will he choose? As conscious creation practitioners are well aware, we create the reality we experience based on the beliefs we choose to embrace. The manifestation of our existence falls directly in line with those choices, for better or worse, so it’s incumbent upon us to choose wisely. In Whip’s case, he maintains that his drinking is clearly a conscious choice. But, based on the events that transpire in his life, it’s also abundantly clear that he’s not fully cognizant of the consequences that can stem from such a choice. He rationalizes the results when they bring “unintended” outcomes, even resorting to lying or shifting blame when it becomes convenient or necessary to disavow himself of un-consciously or semi-consciously created materializations. However, when the stakes become ever more significant, it becomes increasingly difficult for him to continue denying the results – or the source of their origin. In a case like this, accepting awareness of, and responsibility for, one’s creations becomes imperative. Moreover, the longer we remain in denial of such circumstances, the more the ante gets upped to force us into their acknowledgment. And just how does the ante get upped? That’s where our divine conscious creation collaborator comes into play: When we refuse to address our choices and implement needed changes, the Universe (or God, Goddess, All That Is, Source or whatever other term best suits you) steps in, yielding conditions based on our existing beliefs in ever-increasing degrees of magnitude to get our attention and compel us into examining them. If we recognize what’s going on and make the necessary adjustments, new beliefs form and new manifestations arise from them, replacing the previously prevailing conditions. However, if we fail to acknowledge the true nature behind what we’re manifesting, the existing pattern will persist, and the ante will continue to get upped even further. Some may see such circumstances as a cruel joke or the retribution of an unloving, capricious Supreme Being. Indeed, in one scene in the film, Lang explains that one of the causes of the crash under investigation is “an act of God,” a notion that prompts Whip to ask rhetorically, “Whose God would do this?” Whip’s comeback, however, reveals his failure to recognize that his divine collaborator is presenting him with an opportunity to take a hard look at his choices and the consequences they birth. And, as long as Whip persists in that failure, the Universe will likewise persist in prompting him to examine his beliefs and their outcomes – with ever-increasing degrees of intensity. This act (and others like it) are far from being the whims of an unsupportive Universe. Rather, they’re the gestures of a truly loving God, one that so genuinely wants for its souls to succeed in learning valuable life lessons that it’s willing to go so far as to engage in such acts of tough love in order to make its point known. Conscious creators who are well-versed in this practice recognize the hand of their divine collaborator at work when such circumstances arise, enabling them to examine their beliefs (and their resulting creations) and to make whatever changes are necessary to spawn new, more suitable outcomes. For Whip’s sake, one can only hope that he recognizes the divine hand at work and takes appropriate steps to make the most of the opportunities afforded him before it’s too late. Indeed, the prospect of salvation is a significant theme in the film, and it’s reflected repeatedly through numerous visual and narrative references (often directly invoking the name or image of God). It’s a concept that even Whip himself appears well-acquainted with, having successfully saved souls in peril on many occasions, including both his passengers and crew, as well as the new love interest in his life. But, despite his aptitude in rescuing others, does he possess the vision and wisdom to see the need to save himself? Is he aware of the assistance so freely being offered to him by All That Is, as well as by the likes of Nicole, Lang and his longtime friend, pilots’ union representative Charlie Anderson (Bruce Greenwood)? And, even if so, will he ultimately allow it? The payoffs from following the divine lead in this regard can be significant in many ways. By successfully addressing our beliefs and making changes where warranted, we have the opportunity to face fears, overcome self-imposed limitations and conquer self-destructive tendencies, some of which may also have adverse impact on others. As a consequence, we may thus make it possible to achieve mastery and control over our beliefs (especially those of a potentially “negative” nature), produce more satisfying creations, and perhaps even attain salvation or transcendence. Anyone who has successfully tackled addictive behaviors can no doubt attest to the benefits of these results. However, despite the film’s successful treatment of the foregoing ideas, “Flight” comes up short in many other respects. Perhaps the biggest problem is that the picture feels innately “incomplete.” A number of story elements and narrative themes are raised, and danced around, but never fully or satisfactorily explored. For instance, the reasons behind Whip’s alcoholism are never made clear, and even when one possible trigger is hinted at, we find out that his binging began before the events in question. In the alternative, if the film was attempting to suggest that Whip’s drinking arose for no readily discernible reason (as some recovering alcoholics would contend can happen), then this intent should have been made plainly apparent (which it is not). The inclusion of a more substantial back story, or at least a more clearly defined intent, would have worked wonders here. Instead, viewers are left with a big mystery, one that creates a significant hole in the movie’s principal narrative. And this deficiency is just one such example of many that hamper the film’s overall character. Given the nature of the picture’s story line, it’s not difficult to predict its outcome. To counter such inherent predictability, a movie can overcome an innate pitfall like this by providing audiences with an engaging path to the anticipated conclusion. 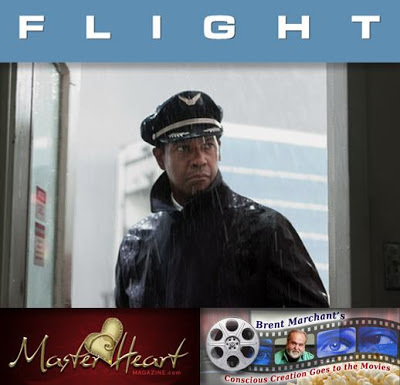 In the case of “Flight,” however, the plotline is riddled with so many gaps and underdeveloped ideas that viewers wind up at the foreseen ending without a clear sense of how or why they got there (or whether they should even care once they do). 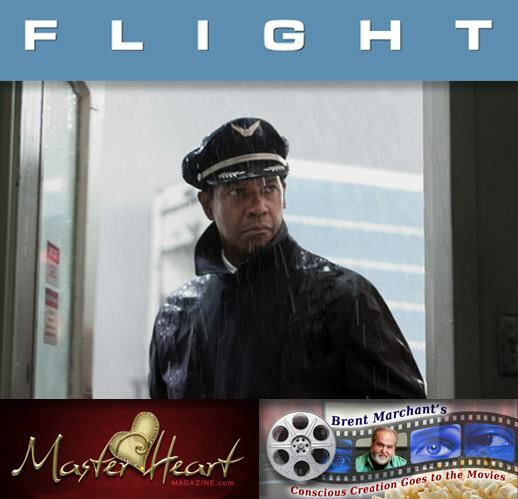 To its credit, “Flight” features some terrific performances, most notably those of Washington (very likely a serious contender for a number of awards season nominations) and Cheadle, as well as great special effects and a dynamite soundtrack showcasing the music of the Rolling Stones, the Red Hot Chili Peppers, Joe Cocker and the Cowboy Junkies. However, these strengths, as well as the picture’s capable exploration of the conscious creation concepts noted above, have their work cut out for them to make up for the film’s other shortcomings. Those who’ve battled addiction often say they that their experiences are a form of escape, of “taking flight” into a reality removed from the vestiges of daily life. Doing so may seem to alleviate one’s difficulties, however, it can also easily become an abrogation of our responsibility as aware and actively engaged conscious creators. The consequences of such actions can be extensive and profound, too, as the film’s protagonist comes to discover the hard way. The sooner we own up to this, the less turbulence – and the more clear skies – we’re all likely to experience. Photo by Robert Zuckerman, courtesy of Paramount Pictures. Catch this and all of my other current movie reviews at Master Heart Magazine. Just click on the tab “Brent’s Movies” on the site’s home page.